WoooHoooooooooooooooo 10/22/2013 | Sorcerers Of The Magic Kingdom: The Blog! This entry was posted in News/Rumors and tagged 61-70, Booster Packs, disney, Ducktales, Facebook Groups, Hat Box Ghost, Haunted Mansion, hints for sorcerers of the magic kingdom, Hitchhiking Ghosts, Huey Dewey Louie, Limited Edition, Master Sorcerer, merchandise, Mickey's Not So Scary Halloween Party, Mickey's Very Merry Christmas Party, MNSSHP, MVMCP, Mystery, Pins, power up t shirts, Prep and Landing, Rare Cast Member Card, Scrooge McDuck, Sorcerers of the Magic Kingdom, sorcerers of the magic kingdom card combos, sorcerers of the magic kingdom combos, SOTMK, sotmk tshirts, spell cards, Trading Groups, Walt Disney World, WDW by sotmkblog. Bookmark the permalink. 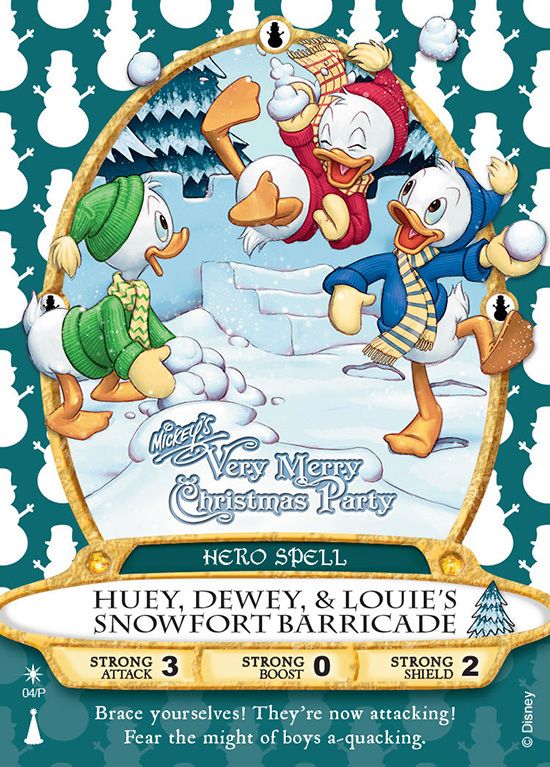 Just so you know, at this years MVMCP they are giving out last years card (Wayne and Lenny) in addition to this years card. It’s probably only until they run out, but it is a nice bonus!